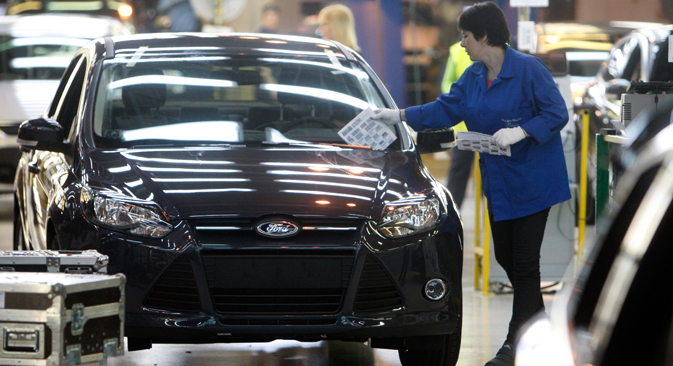 Several leading car manufacturers, including Ford, Renault and Fiat, have rolled back their production in Russia. One of the main causes for this is the 10 percent depreciation of the ruble against the dollar, which has led to higher costs for foreign parts. Several leading automotive companies, including Ford, Renault and Fiat, have rolled back their production in Russia. One of the main reasons cited for the move is the falling ruble, which has lost 10 percent of its value against the dollar, leading to higher costs for foreign parts. The action by car manufacturers is symptomatic of a growing tendency toward fiscal caution among both businesses and individuals in Russia, with many taking steps to shield their assets from risk. According to Mikhail Zadornov, president and director of the VTB24 bank, during the first two weeks in March 2014, bank depositors withdrew 13 billion rubles ($360 million) from their accounts. Investors are acting this way for two reasons: first, the events taking place in Ukraine, and secondly, the sharp depreciation of the national currency. Since the beginning of the year, the ruble has fallen by more than 10 percent against the dollar. “Interest in the dollar has really grown, not only among the population, but also for business – the outflow of capital for the first quarter of 2014, according to the Central Bank, has an estimated worth of $50 billion, which is comparable to the figures for all of 2013,” says UFS IC Research Analyst Stanislav Savinov. According to Savinov, a weakened ruble made ​​imports more expensive, leading to its decrease in the per annum comparison. In particular, relative prices for components for factories, machinery, and equipment, all which allow factories to increase productivity, rose. In April 2014, the Ford Sollers factory near St. Petersburg, a joint venture between the American company, Ford, and Russian Sollers, suspended production until June, when the plant will switch to a single-shift operation for the summer; the company also plans to make about 700 employees redundant. The main reasons were said to be the depreciation of the ruble, the slowing of consumer activity in the market and the fall in demand for cars. In response, France’s Renault LCV and Italy’s Fiat may back out of an agreement to assemble commercial vehicles at the MosavtoZiLa plant in Moscow. Negotiations with Renault have been suspended, and with Fiat they are still on the table, but the Italian side is not demonstrating great enthusiasm. According to the official statement from Renault, its decision was primarily due to the depreciation of the ruble against the euro, which made the issuing of a contract between Renault LCV and ZiLe unprofitable. The depreciation of the ruble is, first and foremost, creating subsidies for domestic producers. However, as Vasily Yakimkin, associate professor at the School of Finance and Banking of the Russian Academy of National Economy and Public Administration claims, those who benefit in the era of globalization have a large share in the creation of additional production for Russian companies. “If the components are supplied by foreign partners, the depreciation of the ruble increases the cost of production. In Russia, imported materials and components products are widely used in production.”Given that Russian plants are buying the latest technology, as a rule, usually in Western currency, the depreciation of the ruble also makes it difficult for them to upgrade their machinery, equipment, etc. “In particular, this is what happened with a line of supply of components to the automotive industry from abroad. Therefore, some assembly was suspended, and the workers were sent on unpaid leave,” said Yakimkin. As a result, according to a Rosstat report released yesterday, the company’s net financial results from January-February 2014 showed a 31.5 percent year-on-year decrease.. This is the sharpest drop since October 2009, when the cause was the result of the economic crisis that began in 2008 and which affected most sectors. Moreover, if nothing changes, according to a Ministry of Finance report, the Russian economy will go into recession during the second quarter. However, despite this, the depreciation of the ruble has already helped domestic industry, according to the Federal State Statistics Service. In March, Russian industry grew by 1.4 percent, and for the quarter, by 1.1 percent. “These data agreed with our expectations that in March and April, this indicator will grow by supporting exporters from the perspective of a weakened ruble,” says Anton Soroko, an analyst for the investment holding company Finam. In general, exporters are paid in foreign currency, primarily for oil and gas supplies. In addition, according to Soroko, in March retail trade in the country rose by 4 percent, despite international sanctions and the complicated political situation.